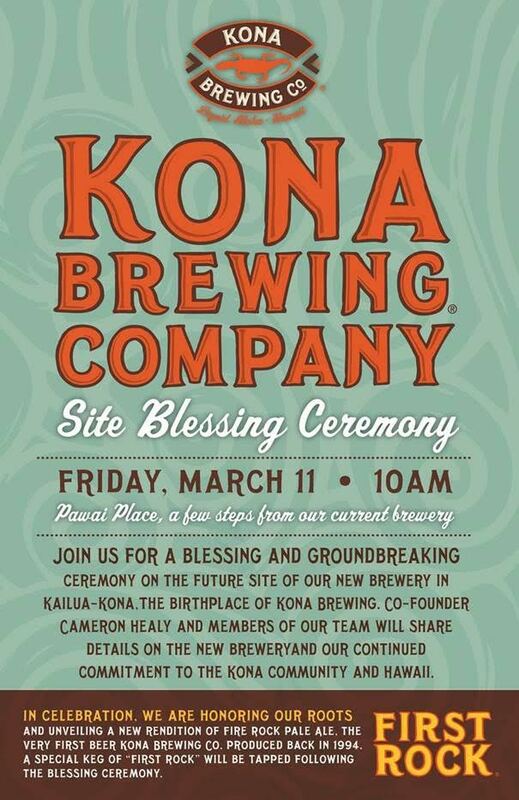 Kona Brewing Co. will break ground on its new 100,000-barrel Big Island brewery and canning facility tomorrow. The company, Hawaii’s longest-running craft brewery, is commemorating the event with a limited-release pale ale based on the original recipe for its first beer produced 22 years ago. The groundbreaking at the 2.6-acre site in Kailua-Kona will include a traditional Hawaiian blessing ceremony and unveil the first architectural rendering of the new brewery. More than 100 guests have RSVP’d to the event at Pawai Place, just steps away from the current pub and brewery. Construction is scheduled to begin in late summer of this year. “We wouldn’t be celebrating this incredible milestone if it weren’t for the Kona Brewing Co. ‘ohana, and we look forward to continuing to support them as they have supported us over the years,” he added. To mark the groundbreaking, Kona Brewing worked with John “Kit” Kittrege, the brewery’s first brew master, to develop a new beer based on the original recipe for Fire Rock Pale Ale, the brewery’s first production beer. First Rock Pale Ale is a hop-forward, malty ale that pays homage to the beer that paved the way for Kona Brewing Co.’s success and liquid adoration. First Rock (ABV 6%, IBU 65) features Pale 2 Row Premium, Caramel 80 and Honey malts, along with Northern Brewer, Cascade and Columbia hops. 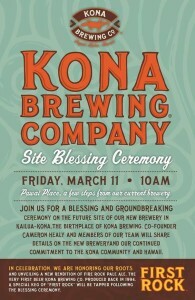 First Rock will be poured at the groundbreaking and will be available until supplies last at the Kona Pub & Brewery. Kona Brewing is investing $20 million to build the state-of-the-art high-efficiency brewery and canning facility that reinforces its long-running commitment to environmental stewardship and sustainability. The 30,000 square-foot facility will feature the latest innovations in renewable energy and water conservation, enabling Kona Brewing Co. to preserve Hawaii’s natural resources. Kona Brewing partnered with PurposeEnergy, a water treatment and renewable energy company, to design an on-site Resource Recovery Center. The Center allows the brewery to recycle organic brewing byproducts in order to produce its own electricity, heat and clean water. The facility will also feature a brewing system manufactured by IDD Process & Packaging, an industry leading supplier of brewing systems and equipment, that helps conserve grain and water. Additionally, solar photovoltaic systems will be installed that can generate 50 percent of the brewery’s energy needs. The brewery will have the capacity to produce up to 100,000 barrels of beer per year, which will allow for increased draft production and package offerings in Hawaii. The new canning operation will enable Kona Brewing to expand its canned beer selections beyond Longboard Island Lager and Big Wave Golden Ale and into a wide array of specialty and seasonal beers. Kona Brewing is leasing the land for its brewery from the Queen Lili‘uokalani Trust, a private charitable trust founded in 1909 to serve native Hawaiian children. The brewer plans to work with local construction companies, suppliers and vendors. Once the brewery is operational, it plans to hire additional employees to expand the current pub. The brewery is scheduled to open in 2018. “The Kona Brewing team is beyond excited to start brewing in the new state-of-the-art facility, which will give us the flexibility to produce more innovative, small-batch beers, while increasing our production capability to satisfy the demand for favorites such as Big Wave and Longboard Lager across the Islands,” explained Sandi Shriver, head of brewing operations for Kona Brewing. “We’re taking Liquid Aloha to the next level, and I’m extremely proud to be part of a team that is a leader in efficiency and sustainability and cares so much about the environment. Kona Brewing Company was started in Kailua-Kona on Hawaii’s Big Island in the spring of 1994 by father and son team Cameron Healy and Spoon Khalsa, who had a dream to create fresh, local island brews made with spirit, passion and quality. Today, Kona is Hawaii’s largest and favorite craft brewery, known for top-selling flagship beers Longboard Island Lager and Big Wave Golden Ale and award-winning innovative small-batch beers available across the Islands. The Hawaii born and Hawaii-based craft brewery prides itself on brewing the freshest beer of exceptional quality, closest to market. This helps to minimize its carbon footprint by reducing shipping of raw materials, finished beer and packaging materials. Kona Brewing has become one of the top craft beer brands in the world, while remaining steadfastly committed to its home market through a strong focus on innovation, sustainability and community outreach. For the second year in a row, the company sold more than 1 million cases of Liquid Aloha in the Islands. Kona Brewing Co. is part of Craft Brew Alliance (NASDAQ: BREW), a leading craft brewing company. This entry was posted in Restaurants and tagged beer, bigisland, brewing, hawaiiisland, kona. Bookmark the permalink.